*In some cases, the option "Use this Plugin" will be available. It is the default action if a plugin is found for the file type. *In some cases, the option "Use this Plugin" will be available. It is the default action if a plugin is found for the file type. 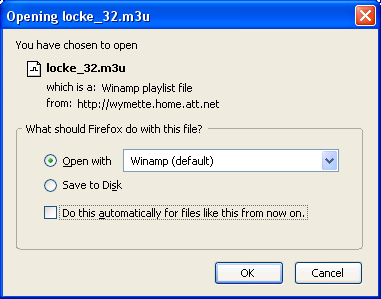 MIME types that are not handled by plugins do not appear in the Download Actions listing unless you have previously encountered that type of file and checked the option in the "Opening" dialog box to "Do this automatically for files like this from now on", [[#Opening dialog|as described above]]. 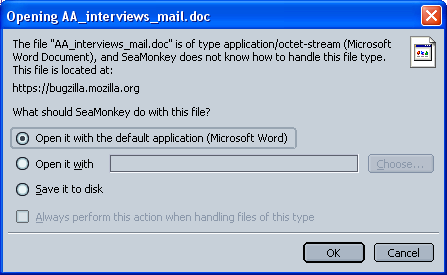 You cannot add new file types to the Download Actions listing in Firefox, as you can in Mozilla Suite/SeaMonkey 1.x. 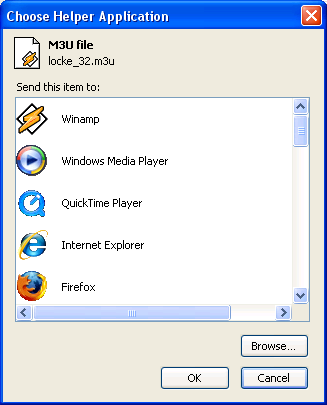 The [https://addons.mozilla.org/firefox/addon/4498 MIME Edit extension] provides the SeaMonkey 1.x "Helper Applications" interface, shown below, as a Firefox add-on. 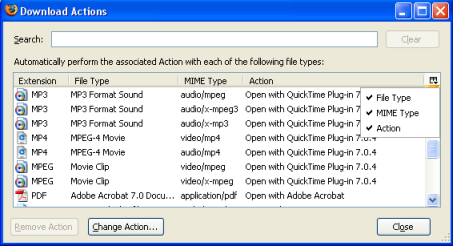 MIME types that are not handled by plugins do not appear in the Download Actions listing unless you have previously encountered that type of file and checked the option in the "Opening" dialog box to "Do this automatically for files like this from now on", [[#Opening dialog|as described above]]. 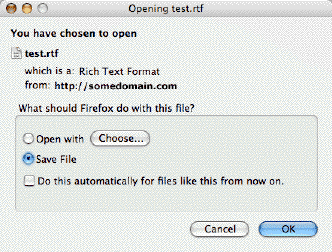 You cannot add new file types to the Download Actions listing in Firefox, as you can in Mozilla Suite/SeaMonkey 1.x. 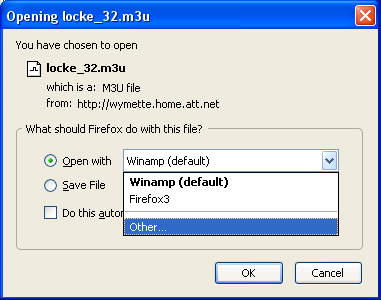 The [https://addons.mozilla.org/firefox/addon/4498 MIME Edit extension] provides the SeaMonkey 1.x "Helper Applications" interface, shown below, as a Firefox add-on. This will not affect media embedded in a web page - only links to the files themselves. This will not affect media embedded in a web page - only links to the files themselves. Note: Mozilla Suite and SeaMonkey 1.x do not list plugin actions in the Helper Applications listing. You cannot disable a plugin for file downloads here. You can check in "[[about:plugins |Help -> About Plug-ins]]" to see which MIME types are automatically handled by plugins. 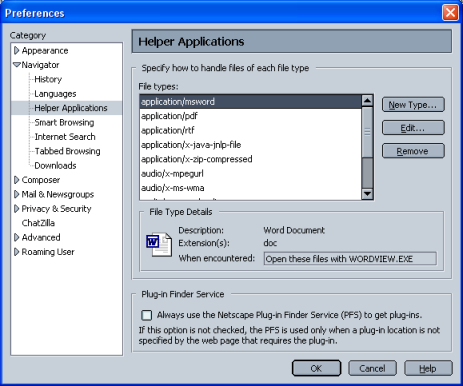 Note: Mozilla Suite and SeaMonkey 1.x do not list plugin actions in the Helper Applications listing. You cannot disable a plugin for file downloads here. You can check in "[[about:plugins |Help -> About Plug-ins]]" to see which MIME types are automatically handled by plugins. 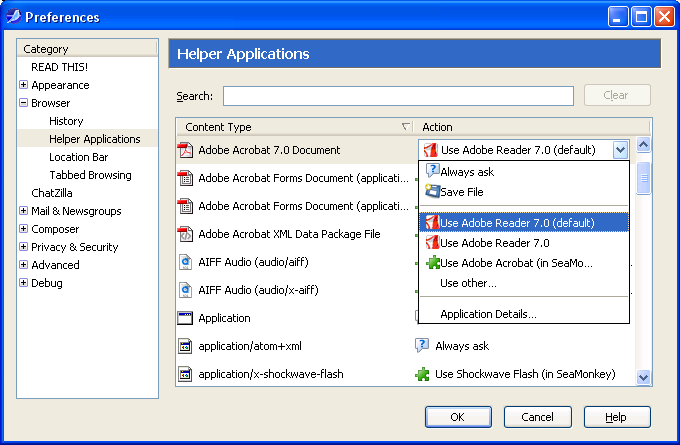 The Helper Applications preference panel (shown above) allows you to add new download actions for MIME types. Clicking the "New Type..." button opens a dialog where you can add the MIME type (e.g. 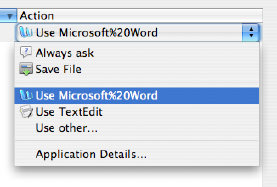 ''application/msword'') description (e.g. 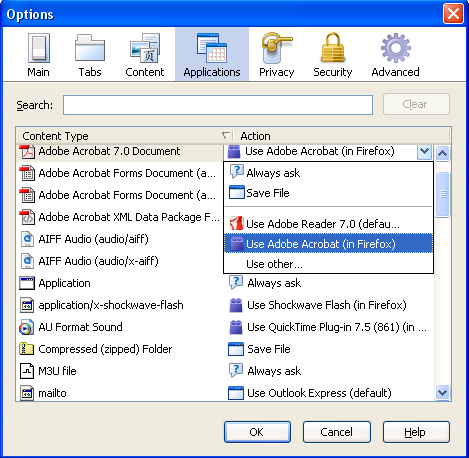 ''Word Document'') and file extension (e.g. ''doc''). You can set the new download action to either open with a specified helper application or save to disk. The Helper Applications preference panel (shown above) allows you to add new download actions for MIME types. Clicking the "New Type..." button opens a dialog where you can add the MIME type (e.g. 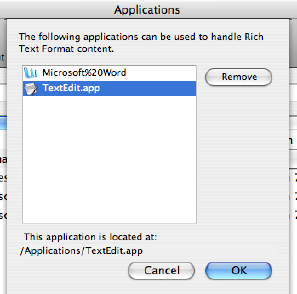 ''application/msword'') description (e.g. 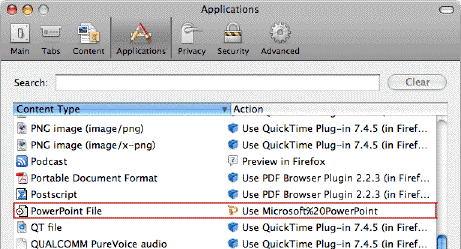 ''Word Document'') and file extension (e.g. ''doc''). 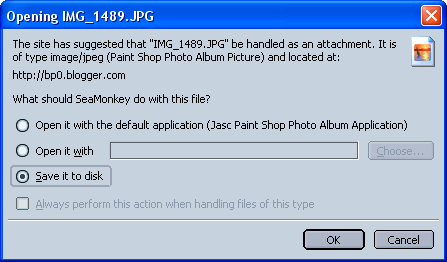 You can set the new download action to either open with a specified helper application or save to disk.